OpenStack is an open-source Infrastructure as a Service (IaaS) cloud operating system. It has evolved to a standard in industry and has already been validated in big cloud deployments. OpenStack is continuously being improved by a large community and supported by various well-known companies. Consisting of several components such as “Neutron” for network management, “Nova” for computing or “Cinder” for block storage, this cloud operating system covers all traditional IaaS functionalities (compute, storage and network) and far more than these. 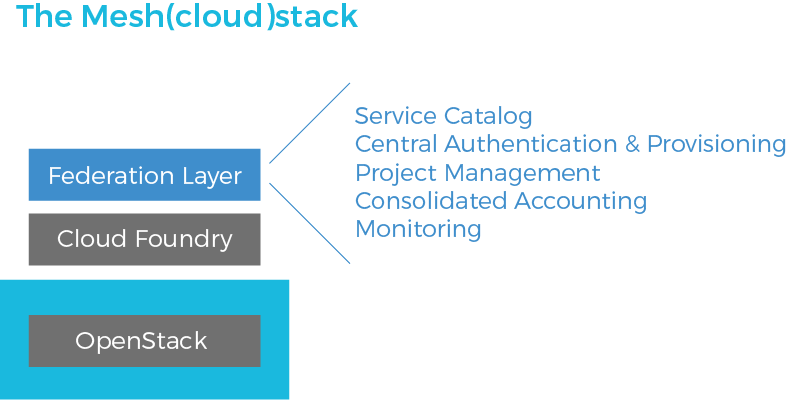 Due to its scalability, OpenStack is especially predestined for hybrid cloud solutions. Enjoy compute infrastructure that is independent from any particular vendor, hosted in Europe and protected by European privacy laws. Our OpenStack comes with a new User Interface, the Meshpanel. Access and administrate your projects across all our data center locations flexibly via the Meshpanel or the API. We have a standardized service catalog across all our locations, which enables you to easily shift your applications from A to B and avoid the maze of prices you see with other providers. We offer a standardized set of VM flavors that cover multiple application scenarios.